Raven A bird of ill omen. They are said to forebode death and bring infection. The former notion arises from their following an army under the expectation of finding dead bodies to raven on; the latter notion is a mere offshoot of the former, seeing pestilence kills as fast as the sword. Marlowe: Jew of Malta (1638). �As if the great god Jupiter had nothing else to doe but to dryve about jacke-dawes and ravens.�- Carneades. �He blacked the raven o'er, And bid him prate in his white plumes no more.� Addison: Translation of Ovid, bk. ii. ��� ���The fatal raven, consecrated to Odin, the Danish war-god, was the emblem on the Danish standard. This raven was said to be possessed of necromantic power. The standard was termed Landeyda (the desolation of the country), and miraculous powers were attributed to it. 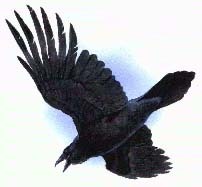 The fatal raven was the device of Odin, god of war, and was said to have been woven and embroidered in one noontide by the daughters of Regner Lodbrok, son of Sigurd, that dauntless warrior who chanted his death-song (the Krakamal) while being stung to death in a horrible pit filled with deadly serpents. If the Danish arms were destined to defeat, the raven hung his wings; if victory was to attend them, he stood erect and soaring, as if inviting the warriors to follow. ���The two ravens that sit on the shoulders of Odin are called Hugin and Munnin (Mind and Memory). ���This hypertext edition is �1996 Data Text Publishing Ltd, and may not be downloaded for any commercial purpose, or reproduced in any form without our written permission. Want to join the Crows And Ravens?